Yamaha fans have a special treat at hall no. 6 with the showcase of the R25 concept motorcycle at the 2014 Auto Expo. The R25 concept will be basis for the upcoming quarter-litre motorcycle from the Japanese manufacturer with a super bike like styling and exhilarating performance. Yamaha has also launched the Cygnus Alpha scooter that has been added to Yamaha’s scooter lineup in India. 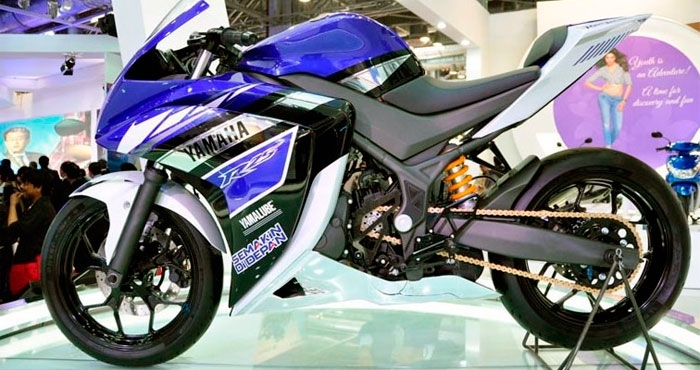 The Yamaha R25 concept carries a 249cc parallel twin-cylinder engine with output figures not revealed yet. The concept has the aggressive super bike stance and has received its styling from the YZR-M1; while the R15 relation is quite evident in the side profile and the rear quarter of the concept. The R25 misses out on the lights, switch gear and other smaller bits, which will be added to the production spec model. On the other side of the world, we have also heard that Yamaha have registered a new name, the YZF-R3 which is speculated to be the name for a triple cylinder sportsbike that sits above the R6 in displacement. However, we had earlier estimated that we may actually see Yamaha bring the R25 (named R3?) to India has a 250cc or 300cc single to make the motorcycle more amenable to the Indian market in terms of pricing and positioning. But the depressing new is that Yamaha has confirmed to OVERDRIVE that the R25 production motorcycle is not slotted for Indian launch within this calendar year and other rumours say that it isn’t even in the plan through most of 2015. This is obviously speculation but it ties neatly in with the notion of Yamaha being hard at work on an India-specific (with applications in other emerging and cost-sensitive markets) engine for the R3.